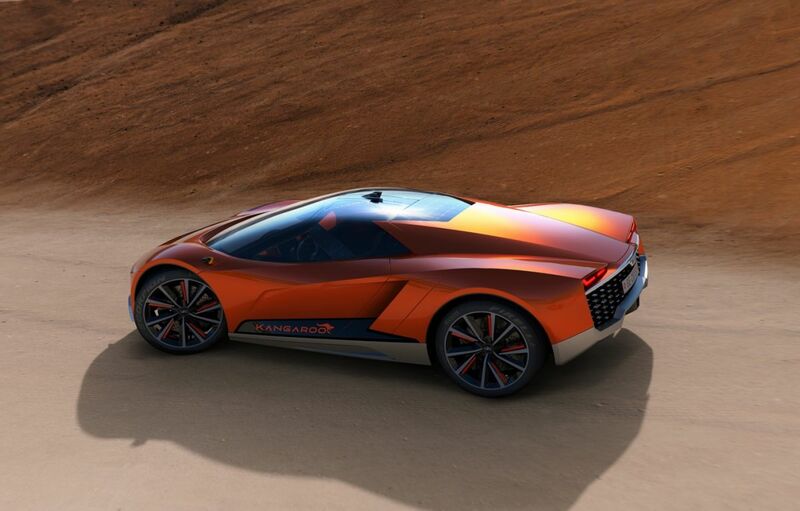 El nuevo concept-car de GFG Style, una start-up creado por el gran diseñador Giorgetto Giugiaro, es un modelo de dos-plazas, tipo SUB hiper, con tracción y dirección a las cuatro ruedas, apto para cualquier terreno grancias a su funcionalidad y tecnología. Y este nuevo Kangaroo es totalmente eléctrico. uncompromising passion and sportiness in one car, for any road condition: be it track, sand, dirt or snow. A concept that can arouse excitement and meet the needs of an increasingly demanding clientele, in search of innovative styling architectures with the maximum that technology allows today, both inside and out”. This high-performance concept has already been tested on the ice-bound tracks of St. Moritz, where it amazed everybody for its dynamism and aesthetic impact: a high performing yet comfortable car, seemingly extreme but in fact highly rational, with forms suitable for performance without sacrificing beauty. The appearance of the front already announces its ambitions, with a serious look into the future, thanks to the headlight technology and adaptive spoiler. This appearance changes with the configuration input, which modifies vehicle trim and adapts to the performance of the moment. The nose features the GFG aluminum frieze, a signature feature of GFG Style prototypes. In keeping with the tradition of extreme Grand Tourers, the passenger layout offers two extreme seats. The side panel is sculpted to accommodate big 22" wheels, the car&apos;s primary impact feature. The rear is conceptually similar to the front, with the recessed lights generating an expression of sportiness while overhanging a large air outlet; the latter conceals the functions of arrow and reverse lights, through small prisms of Led crystal that create a precious "jewel effect". Accessibility is once again refined and innovative, as the upper part of the dome lifts up gullwing fashion, while the lower part, the door itself, has a slightly "scissors-like" opening. Special cameras and sensors are located on the roof for autonomous driving purposes, and other cameras are slotted into the mudguards, which also include the direction lights. The "cut" next to the door, which may look like a wing to let air in, is in fact the flap, present on both sides, to fuel the car with two different types of charging (one fast and the other standard). As for the interior, the two-seats-only formula offers two sporty but surprisingly comfortable seats with a special design featuring cushions fitted to a carbon structure so that driver and passenger are almost "lifted up" by the seat frame, thus ensuring comfort without sacrificing wraparound and restraining functions. 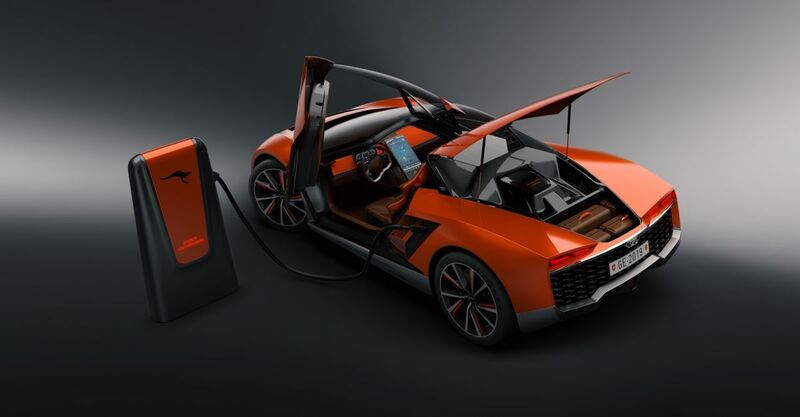 The electric platform was developed in collaboration with CH Auto. A carbon fibre body is set up on an advanced space frame that houses two 180 kW motors. The body is in carbon fibre while the wings, for minimum weight, are in polycarbonate and the windscreen in glass. The main dynamic feature, from which the name derives, is the possibility of raising and lowering the vehicle body by 120mm, via three configurations: Racing (140mm), dedicated to high speed, Road (190mm) and Off-road (260mm); another feature is the camber of the wheels that, depending on the configuration, changes to ensure a different degree of sportiness. GFG Style was born in 2015 from the extraordinary experience in the field of car design of its founders, Giorgetto and Fabrizio Giugiaro. Giorgetto is known all over the world as one of the most successful designers in automotive history. Fabrizio has been active in car design, industrial design and the planning and development of car interiors and exteriors for public and private clients for over 30 years. CH Auto Technology Co., Ltd. is a professional automotive R&D service company in Beijing, China. CH-Auto has provided customers worldwide with automobile design development and engineering services, including styling, engineering, CAE, prototype fabrication, supplier management, launch services and improvement & renewal implementation.